Cardinal Gin, a small-batch gin from Southern Artisan Spirits in Kings Mountain, was the only American-made gin to win double gold at the San Francisco World Spirits Competition, held earlier this month. The competition had 1,200 spirits from 65 countries. All spirits are tasted blind by 34 judges. Cardinal also has won a gold medal from the Beverage Testing Institute in Chicago and got the highest rating for a domestic gin in 2011. 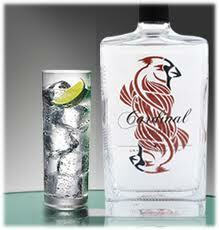 Cardinal is hand-crafted with 11 organic and wild-harvested botanicals. It's distributed in N.C., S.C., Virginia, Georgia and New Jersey. For details on where to find it, go to www.southernartisanspirits.com. Do I run too many asparagus recipes in the spring? Guilty as charged. With no apologies: Asparagus is one of those things that tastes fabulous when it's fresh and disappointing when it's frozen or canned. When it's in season, you have to eat your fill because it won't be back in season for 11 months. Still, eating your way through that much asparagus can get a little repetitive. I've worked my way through several cooking methods -- microwave-steaming, oven-roasting, pan-braising. But what I wanted recently was a new way to top it. PLACE the eggs in a saucepan and cover with cold water. Bring to a boil. Cover, remove from heat and let stand 16 minutes. Remove eggs to a boil of ice water or rinse to cool. Peel and roughly chop. COOK asparagus however you like (it works great with this microwave-steaming method from Alton Brown: www.obsbite.blogspot.com. MIX mayonnaise, mustard, water and vinegar in a small bowl and whisk to combine. Season to taste with salt and pepper. ARRANGE asparagus spears on a platter or on salad plates. Spoon the sauce over them. Top with chopped egg and chives (if you're into garnishing). Cooking when you're older isn't the same as cooking earlier in your life. Smaller appetites, diminished taste sensation and health issues all play into it. And then there's the whole issue of cooking for one or two instead of a family. The Sunrise Senior Living centers have a new food blog to address that, Senior Eats. Updated several times a week, it includes recipes and short articles with advice on things like shopping for one. Take a look or pass it along to someone who could use the information. 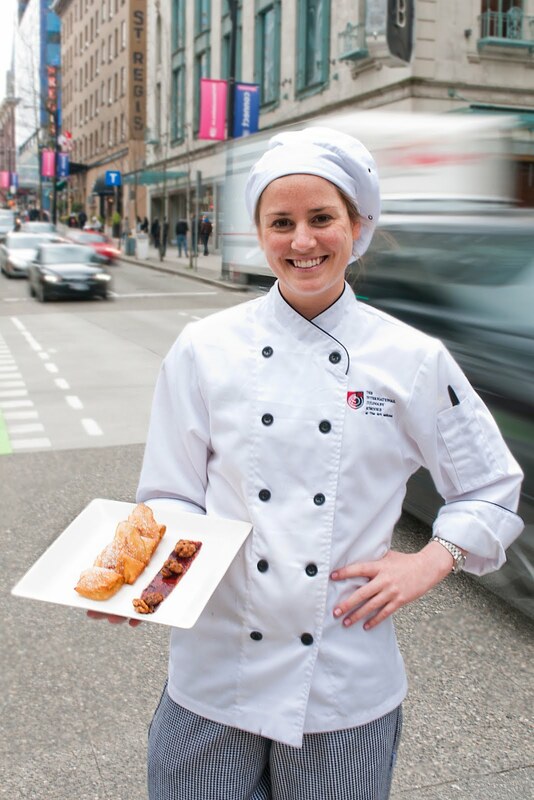 Francie Rudolph, 24, of Charlotte is a culinary arts student at the Art Institute of Vancouver. But Rudolph took on Canada recently and was named the grand prize winner of a Canadian contest for pear recipes, the 2012 "Pear Excellence" Canadian Culinary Student Recipe Competition, sponsored by USA Pears. Rudolph won $2,500 and coverage on Canadian TV with her winning dish, Pear and Sweet Goat Cheese Filled Beignets. Rudolph went to Charlotte Country Day School and the College of Charleston before heading to Vancouver and the Art Institute. Beignets: Mix water, sugar, and yeast in a large bowl and let sit for 10 minutes. In another bowl, beat the egg, salt, and evaporated milk together. Add egg mixture to the yeast mixture. place for at least 2 hours. soft. Remove from heat and cool. Puree half the pear mixture until thinned out, adding lemon juice. Stir in remaining pear mixture, soft goat cheese, honey, powdered sugar and grated lemon zest. degrees for 30 minutes, stirring occasionally. Remove from oven, and separate nuts as they cool. slices from pot and place onto a parchment-lined baking sheet. Bake at 200 degrees for 2 hours. towels, and then dust with confectioners’ sugar. The restaurant Tupelo Honey in Asheville has started something the world is surely waiting for: A Pimento Cheese of the Month Club. For $199 (with free shipping if you order before Mother's Day, not that they're making a hint), you get six shipments, one every other month for a year. Each shipment includes 16 ounces of "gourmet hand-crafted pimento cheese" from the restaurant, 7 ounces of grass-fed charcuterie from Hickory Nut Gap Farm, and artisanal vegan crackers from Roots and Branches. 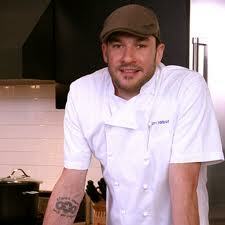 For more information or to sign up, go to www.tupelohoneycafe.com. And before you get all het up, remember: I did not willingly type the words "gourmet hand-crafted pimento cheese." I'm just the messenger, people. After the Harvest Moon Grille/Grateful Growers Farm sausage-making class sold out recently, they added a second one. This one is 2 p.m. April 29 at Harvest Moon Grille (in the Dunhill Hotel in uptown Charlotte, at North Tryon and 6th Street). For your $30, you get a lesson from chef Cassie Parsons and Kelly Slade, and you get a package of sausage to take home. The class is obviously very popular, so you need to reserve a spot. Call 704-342-1193 to do that. 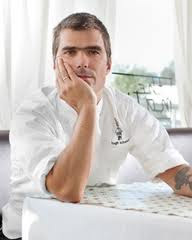 Several weeks ago, I wrote about the journey of Charlottean Sam Talbot, who started out working in local restaurants when he was 14 and was an early finalist on "Top Chef." These days, he's not only a celebrity chef in New York, he has a book, "The Sweet Life: Diabetes Without Boundaries," that's part cookbook and part lifestyle book on how he lives the high-profile life while managing Type 1, insulin-dependent diabetes. Talbot will be in Charlotte at 11 a.m. May 12 to sign copies of his books at Park Road Books. He doesn't come back to Charlotte all that often, so make sure you stop by and say hello. Remember the "No More 'Mallows" recipe contest? The N.C. Sweet Potato Commission asked bloggers to enter recipes for the chance to win $2,000. So who won? That would be Nikki Haney of the blog The Tolerant Vegan. Her entry, Maple Sweet Potato Pecan Burger, was chosen from more than 130 entries. To see all the winning recipes, including the runnersup, go to www.ncsweetpotatoes.com. 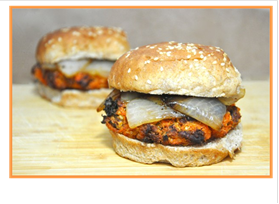 Judge Kate Rockwood of O, The Oprah Magazine, called Haney's vegan burger her "go-to burger for spring." In case you need a go-to vegetarian burger for spring, here you go. Maple Sweet Potato Pecan Burger From Nikki Haney of thetolerantvegan.com. Bring 3/4 cup water and quinoa to boil in a small saucepan. Reduce to a low simmer, cover and cook 8 to 10 minutes, until the water is nearly absorbed and quinoa appears transparent. Remove from stove and let sit, covered, for 5 minutes. Melt 1 tablespoon butter in a separate saucepan. Stir in 1 tablespoon maple syrup and the cayenne. Add to the mashed sweet potatoes with the kale, cooked quinoa, pecans and 1/2 teaspoon salt. Mix well. Form into 4 patties; place on a well-oiled baking sheet. Bake for 35 minutes, turning once halfway through cooking. About 15 minutes before the burgers are finished, make the onion topping: In a small skillet over medium heat, melt the remaining 1 tablespoon butter. Add the onion, sprinkle with salt and freshly ground black pepper. Cook and stir for 12 minutes. Reduce heat to low; add remaining 1 tablespoon maple syrup. Cook and stir until onions are slightly brown, about 3 minutes. Remove from heat. Transfer burgers to buns and top with the onion mixture. Cuban is 1-4 p.m. Sunday, April 29. Dishes: Arroz Con Pollo, Ropa Vieja, Black Beans and Rice and Capered Baked Fish. $65. French is 9:30 a.m.-noon Monday, April 30. Dishes: Spinach Souffle, Tomato and Eggplant Timbale, Chicken With Herbs de Provence and Custard-Stuffed Profiteroles. $55. Mediterranean is 9:30 a.m.-noon Monday, May 14. Dishes: Pita With Olive Oil, Za'tar and Sumac, White Fish poached with olive oil and pesto, Beef Kebabs With Olive Oil, Herbs and Lemon and Lemon Olive Oil Semolina Cake. $65. Spain is 11 a.m.-2 p.m. Saturday, May 19. Dishes: Chorizo Tapas, Paella, Catalonian Chickpea Salad and Orange-Glazed Flan. $65. Then it gets a little more local, with Fresh from the Farm, 9:30 a.m.-noon May 21, $55; and guest chef Ben Miles of BLT Steak, noon-2 p.m. May 26, $75. Register for classes online, at www.reids.com. When everything fresh and green starts pouring into the farmers markets, it's hard to resist an impulse buy. My bags were already full Saturday morning at the Charlotte Regional Farmers Market when I spotted a pile of fava bean pods. Favas aren't all that common around here, so when you see them, you better grab them. I filled a bag with several big handfuls and then started thinking about what to do with them. I know to set aside time for favas. They're a strange bean and they take a little more work. First, you have to open the big pods, which can be as long as a wooden ruler, and free the fat beans. They'll have a strange, white-ish appearance. That's the outer skin in the bean. The real bean, as bright green as fresh grass, is inside that skin. To get to it, you drop the shelled beans in boiling water for 2 or 3 minutes, then drain and rinse with cold water. Then you squeeze the white casing and the bright bean pops out. With that much work, it's good to find a way to stretch your favas. I pulled cookbooks off the shelf and finally hit on this one: A very bright, very green salad from "The Food Matters Cookbook," by Mark Bittman. As it turned out, I also had picked up asparagus and a couple of long stalks of garlic scapes that were so crisp and fresh, I could dice the stalks and use them like asparagus, too. The recipe didn't call for them, but sometimes you have to improvise. Spring is like that. CHOP 1 whole lemon, peel and all (discard seeds and pointed ends). Place in a serving bowl with juice of 2nd lemon, salt and pepper and olive oil. Let stand while you prepare the vegetables. SHELL the fava beans. Bring a small saucepan of salted water to boil. Add the favas and cook about 2 minutes. Remove from water with a slotted spoon. Drain in a colander and rinse with cold water. Squeeze each bean to remove from the skin. Add to the lemon and oil mixture. RETURN water to boil and add asparagus. Cook until just tender, about 3 minutes. Drain and rinse, then add to bowl with the favas. Add the mint and toss well to mix. Refrigerate about 2 hours before serving. Things around food blog world will be quiet next week. I'm taking a little time off. Click and pick. It makes everyone happy - including my bosses. When the new book "Farm Fresh Southern Cooking," by Tammy Algood arrived recently, I was expecting squash casseroles and green beans, not a chunky shrimp dip. But friends were coming over and I needed a substantial appetizer for noshing. It certainly fit the bill. Easy to make, simple ingredients and plenty of flavor. My book club approved. Since it's chunky, serve it with scoop-shaped tortilla chips but include a small knife or spoon so people don't break their chips in the bowl. From "Farm Fresh Southern Cooking," by Tmamy Algood (Thomas Nelson, $24.99). Combine the cream cheese, mayonnaise, pepper liquid and mustard and beat with an electric mixer on low speed. Fold in the shrimp, celery, onions and peppers. Transfer to a serving bowl. Cover and refrigerate at least 1 hour (and up to 24 hours) before serving. Serve chilled with hefty chips or crackers. The year's hot food movie - or actually cold, given the subject - will open April 27 at the Park Terrace. 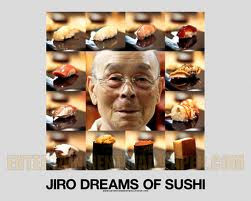 I got to see a very advance screening of 'Jiro' last October at a James Beard Foundation event in New York, and I can tell it's a special kind of food-movie magic. 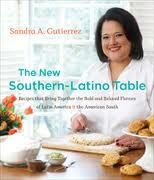 Gutierrez will be in Charlotte at 7:30 p.m. April 17 to talk about her book and her cooking. She'll be at the Levine Museum of the New South as part of CPCC's Sensoria festival. Co-sponsored by Women's Inter-Cultural Exchange, it's free, but you do have to reserve a seat. Call 704-333-1887 or send an email to rsvp@museumofthenewsouth.org. When asparagus is in season, I have one simple mission: Get as much of it in me as possible. This year, I might have time to get enough. The fresh, local asparagus turned up at the Charlotte Regional Farmers Market last week. How to cook it without getting bored? I usually roast it (toss the stalks with a little olive oil, sea salt and pepper in a single layer in a shallow pan and slide it in the oven for 10 or 15 minutes at 375.) 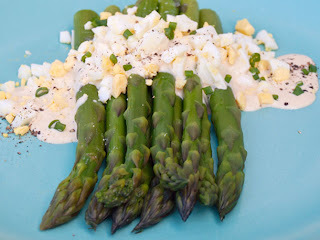 Or I pan-roast it: Put in a cast-iron skillet with 2 tablespoons oil and 2 tablespoons water, cover and simmer for 5 to 8 minutes, until the water cooks away and the asparagus is finishing in the oil. Both are fine. But I wanted more. Sometimes, I don't want to heat up the oven, or the top of the stove is busy with other things. I was wasting time -- um, doing research -- one day last week when I stumbled on a video by Alton Brown on the best way to microwave asparagus. I tried his method twice this weekend and darned if Geek Guy isn't right. It's pretty much foolproof and it yields asparagus that is sweet and grassy, with just enough crunch left. 1. Pour 1/4 cup water into a shallow plate. 2. Take 2 paper towels (he says 3 or 4, but I only needed 2), fold them up to fit in the plate and place them on the plate, turning to soak up all the water. 4. Sprinkle with salt -- kosher, sea or regular. About 1/2 teaspoon for 1 pound, a little less for less. 5. Roll up the asparagus in the paper towels. Place in the microwave. 6. Zap for 3 to 4 minutes, depending on the thickness of the spears. (3:30 was perfect for fatter spears; skinny ones probably only need 2:30). Unroll and eat. There are cookbooks on cooking for one, but two is the neglected number. Yet cooking for two is just as difficult as cooking for one. There's not enough room for two of you to lean over the sink with a bowl of cereal. I've been getting a taste of the two-ful myself this year and it is a dilemma. You still need to cook a meal, but even a recipe sized for four can get out of hand with leftovers. So I was ready for it when a new America's Test Kitchen book landed on my desk: "Cooking for Two 2012: The Year's Best Recipes Cut Down to Size." I can't vouch for that "year's best recipes" part -- I don't recall getting a ballot for that one. But the book certainly has handy touches. My favorite is a list of the recipes broken down by the amount of the main ingredient. When you get stuck with half an avocado or part of a can of diced tomatoes, you can pick a way to use them. For the most part, the recipes are simple but not too plain, like trimmed-down Pad Thai and easy grilled suppers. With a bunch of ham leftover from last week's Easter story, this one was just what I needed and easy enough to whip together on a weeknight. Melt butter in a 12-inch nonstick skillet over medium-high heat. Add the ham and cook, stirring occasionally, until lightly brown, about 10 minutes. Using a slotted spoon, transfer ham to paper towel-lined plate; set aside. Add garlic and 1/4 teaspoon ground pepper to now-empty skillet and cook until fragrant, about 30 seconds. Stir in wine and simmer until nearly evaporated, 2 to 4 minutes. Whisk the cream, egg and cheese together in a small bowl. Remove the skillet from the heat, pour the egg mixture over it and toss to combine. Stir in the ham and season with salt and pepper to taste. Sprinkle with parsley or basil if using. Serve immediately. NOTE: When I made this, I simplified it by using 3 1/2 cups broth rather than broth and water. And I used half-and-half instead of heavy cream. Both changes worked fine. Poor Don Draper. He never landed the Rolling Stones to do that jingle for Heinz baked beans. But it wasn't so far-fetched to try: Mick and friends did do a commercial jingle. When I see the cache jar by my stove bristling with whisks, it's hard to remember that there was a time when a whisk wasn't something you saw in every American kitchen. Some sources credit Julia Child with bringing the whisk habit back from France and professional kitchens and convincing home cooks that whisks should be an extension of our hands. I can't say for sure if that's true, but I know that in my mother's kitchen, we didn't have whisks. We had forks. We had forks, by golly, and we were glad of it. There were always a few beaten-up forks that were too bent to be any good even on the lowliest weeknight dinner table. Those became our egg beaters and our fried-food stabbers. Today, I have a whole jar of whisks. They seem to follow me home. And it's funny, but it was years into my career as a food writer before it occurred to me to notice that not all whisks are built alike. Balloon whisks. This are very light whisks, which thinner wires and wide, bulbous shapes. They should have at least nine wires, but more is even better. They're for mixing air into things, like egg whites and heavy cream, and they need to be light so they don't push the air out of things and so that they don't wear out your hand. You can also use them to mix dry mixtures, like getting the baking soda and salt well-distributed in the flour. French, or sauce, whisks. These are narrower, for getting all around a mixture in a saucepan. They also can be heavier and sturdier than balloon whisks. You usually don't whisk as continously with a sauce whisk. Flat, or roux, whisks. These look like squashed whisks, with a flattened shape. They're dandy for whisking flour into fat to make a gravy, although their elongated shapes also can be effective for whisking together batters in a mixing bowl. A heavy whisk. I have one whisk that's not really a balloon and not really a French. But the tines are much thicker than my other whisks, making it really handy for bashing things into other things -- it can double as a potato masher, for instance, or it can handle a thick batter if I don't want to go to the trouble of involving the stand-mixer. Good handles. We tend to notice the tines on a whisk, but we forget to notice the handle. And the handle is what actually spends time in our hands. Wooden handles are usually comfortable. Wire-wrapped handles? Not. And they have a bad habit of rusting. Multiple sizes. Sometimes you need a big whisk, sometimes you need a medium-size whisk. There's nothing wrong with variety. What you don't need: Novelty whisks. The ones that are straight wires with balls on the end, the ones with complicated shapes that involve wires bent into circles in the middle? I say skip 'em. They don't whisk any better, and they get all tangled up with the better whisks. And after getting fooled many times by cute, tiny whisks, I finally learned: A fork works better. My mother could have told me that. Who can keep up with all the great restaurants opening up around town? The annual April fundraiser Taste of the Nation is like a big crib sheet, a chance to get a taste and a feel for a place. I've been one of the judges wandering around with clipboards several times over the years and it's always an eye-opener to see which young chef really puts in an effort and takes chances. If there's a new ingredient or a new method, somebody will try it. I had my first bite of seared pork belly and my first sous vide egg there. Of course, that makes it sound more high-faluting than it is. If you just want to get a couple of drinks, eat some good bites of food and hang out with friends, you can do that too. And the ultimate reason, either way, is to raise money to raise money for Share Our Strength and the fight against childhood hunger. That's really what Taste of the Nation is about. This year's Charlotte edition of Taste of the Nation is 7-10 p.m. next Wednesday (April 11) at the Wells Fargo atrium. Regular tickets are $85, although if crowds aren't your thing, you can get a VIP ticket for $100 that gives you entry into a quieter seating area and an hour to peruse the food before the main doors open. This year's restaurants: Amelie's, American Roadside Burgers, Brixx, Central Piedmont Community College (they always do something over the top for their chocolate display), Chima, E2, Electrolux, Enso, Fern, Flatiron, Gallery at Ballantyne, Halcyon, LaVecchia's, Mama Ricotta's, Mert's, Mimosa Grill, Queen City Q, Rocky River Grille, Savannah Red, Upstream, Vida Cantina, Village Tavern, Vivace, Whole Foods, Wolfgang Puck's Pizza Bar, and Zink American Kitchen. Need details or tickets? www.charlottetasteofthenation.com or call 704-376-1785. We're taken with the name of the pinot noir celebration at 6 p.m. April 25 at Arthur's Wine Shop in SouthPark: "Pinot for Your Patio." I like my patio, but I'd rather drink the pinot myself. Luckily, Robert Balsley will feature a tasting of pinots from around the world. As pinot fans know, that's worth a lot more than the $10 price of the festival. Reservations are required. Call 704-366-8610 or enail arthurswineshop@bellsouth.net to grab a spot. I was fast-flipping through a food magazine when I spotted this recipe in a Jello pudding ad in Food Network. How could I miss it? They had a cookie version of angry birds glaring at them (it's an ad -- you figure it out). Looking over the recipe, I immediately thought of a few changes. It's spring, so why not add strawberries to the bananas, to boost the flavor? And why not melt semisweet chocolate with a little shortening, to make a more solid chocolate coating? Beyond that, it's almost as easy as opening a bag of jelly beans. In a small bowl, mash up the banana and the strawberries. In a medium bowl, whisk together the pudding mix and milk just until pudding is moistened. Immediately stir in the cake crumbs and the bananas and strawberries. Line a baking sheet with wax or parchment paper. Shape the mixture into small balls, about 1 1/2 inches wide. Place in the freezer for 1 hour to harden. Melt the chocolate in a small saucepan over low heat, or in a bowl in the microwave for 1 1/2 minutes, stirring every 30 seconds. Stir in the shortening. Using a fork to lift them, drop each cake ball in the chocolate and roll it around to coat, then move it back to the wax paper. Sprinkle with multicolor sprinkles. Refrigerate until chocolate is set.